Description of issue: So i currently am running 2 PLEX Media Servers, PMS1 is on My Windows 10 PC (Main for others to use) the PMS2 is on my Nighthawk X10 (Backup in case main goes down) I have everything setup with PMS1 fine, but when i goto Settings>Connect and try to add the PMS2 with the ip of 192.168.1.1 i get a message “Unable to connect to Plex Server”. If i type 192.168.1.1:32400 it will open up for me in Chrome. Is it because its brand new and updating content? Is there something i else i need to do? Here is a screen capture of what I see when i try. What do the debug logs show? I’m having a similar issue. Not seeing any debug messages there, this is just the error and a validation warning being logged. Assuming Secure connections are allow on the PMS side (they are preferred by default) I don’t see any issues with this request, but unfortunately the logs don’t indicate if it failed due to an error response from PMS or something else, we’ll have to add more logging for that. 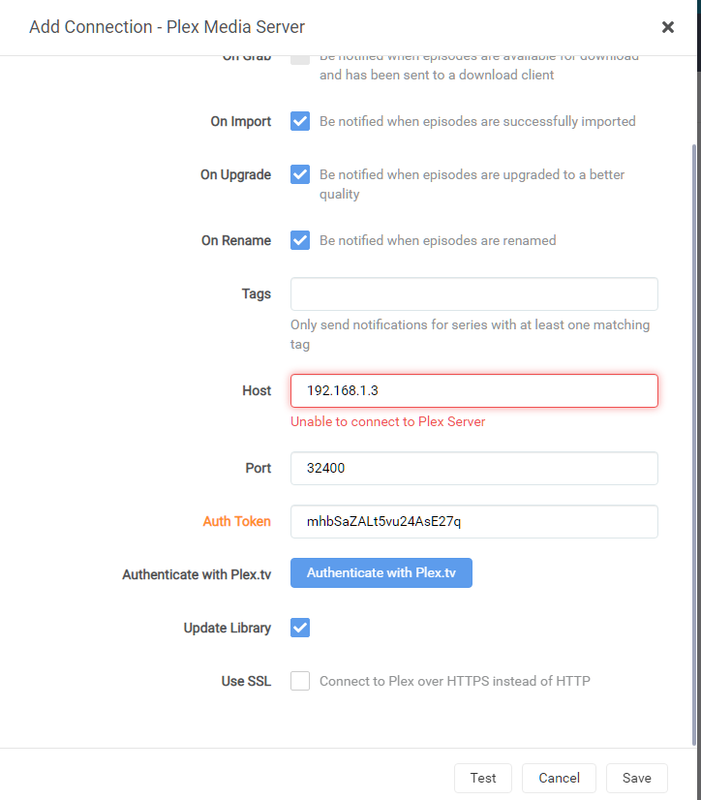 [v3.0.1.441] NzbDrone.Core.Notifications.Plex.PlexException: Unable to connect to Plex Media Server ---> System.Net.WebException: The request was aborted: The operation has timed out. OK so i was looking and seen the word “proxy” and yes I use a proxy for it but once i uncheck the proxy it allowed me to add the remote connect. 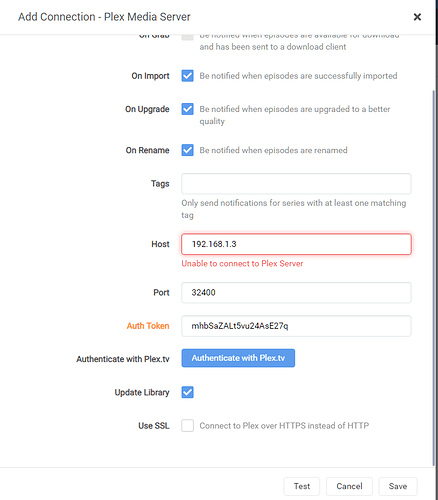 is it my proxy or sonarr having issues using a proxy? EDIT: Also if i bypass the NAS’s IP it with the proxy on it allows me to save/create it. The “proxy” you see in the logs is just the name of the file in Sonarr’s code. Based on what you’ve said, it sounds like the proxy is the issue and bypassing it for that IP is what you’ll need to do.